Fit for Gopro Session, Hero 5, 4, 3+, 3, 2, 1. 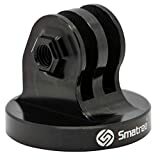 Smatree® Aluminum Tripod Mount Adapter for GoPro Hero 5 Hero4 Hero3+ Hero3 Hero2 Hero1 Camera 1. Made of high quality Aluminum with a Threaded End. More durable than equivalent plastic accessories while still remaining lightweight. 2.The tightening thread is built in, convenience and no worry about losing the nut. 3.Perfectly compatible with all original housings. 4.Package:1* Aluminum Tripod Mount Smatree®:Your support is our best motivation. If for any reason you are unhappy with any product by Smatree®, please do not hesitate to contact Kumu-UK Customer Service with your order ID. We take full ownership and responsibility for the quality of our products and will do our very best to solve your problem quickly and efficiently! Smatree® is a registered trademark protected by US Trademark Law. Smatree® products are sold by authorized sellers only. Kumu-UK is the sole agent of Smatree® on Amazon. This entry was posted in Discount Photography and tagged Adapter, Aluminum, Black, GoPro, Hero, Mount, Session, Smatree, Tripod by Ball Photo. Bookmark the permalink.